Issued for the Israeli Military (IDF) Commando unit "Shayetet 13" in th 1970'S, the back cover is marked with the military marks and numbers. Steel screw in back cover, original screw down crown, clean crystal free from scratches. The bezel insert was replaced. 41.5mm x 45mm (excluding the crown). Original Black color dial, original hands. Automatic wind Movement ETA Cal. The watch comes with a very nice "Vintage" Gray color leather strap. The watch is 100% authentic, in a good condition for it's age. The watch is in a working order, keeps good timing, all functions are in working order. These charges are the buyers responsibility. The item "Rare Vintage S. Steel Eterna-Matic Super Kontiki IDF Military Diver's Watch" is in sale since Wednesday, October 24, 2018. 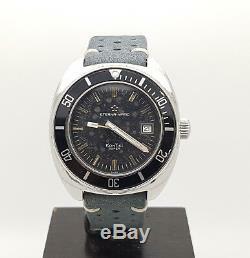 This item is in the category "Jewelry & Watches\Watches, Parts & Accessories\Wristwatches".watch" and is located in Israel.